Heat of summer got ya down? Have an insatiable need for cookies but don't want to turn the oven on? I'm here to save the day. 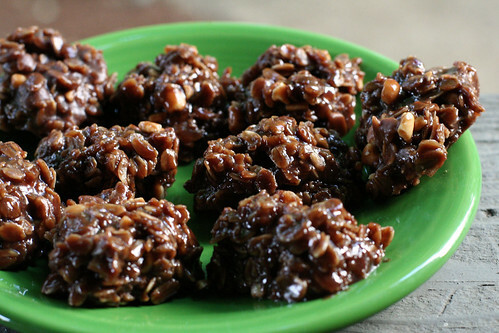 To be fair, these no-bake cookies, a family recipe from my friend Bonnie, do require a bit of stove time. So they don't avoid artificial heat sources completely. However, they're quite a crowd-pleaser and an easy way to get a sweet fix. Plus, they have oats in them, so they're healthy. Bonus! 1. Combine first four ingredients in a medium saucepan. Bring to a boil and boil hard (bubbles that you can't stir down) for one minute. Remove from heat. Stir in remaining ingredients. 2. Drop quickly onto waxed paper, by heaping teaspoons. Refrigerate to harden. Mmm, I love the texture of cookies like these!! They look delicious. These remind me of college, where I was first introduced to them. LOVE them, especially cold from the fridge! One of my Facebook Page Fans posted this recipe and said it was delicious. So I thought I would drop in to say HI, I'm Mr.CBB. I'm going to give these a go and see what I think. Cheers Mr.CBB.... come on over and join us ON FB!